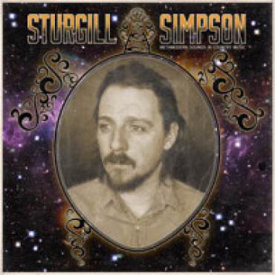 Kentucky Cowboy Sturgill Simpson only released his debut album High Top Mountain in June 2013 (UK Feb 2014). To say it took the industry by storm would be an understatement, yet here he is with the follow-up, what seems only week later. An old-time radio presenter crackles the introduction to classic country-sounding “Turtles All The Way Down”, and we are on way to an hour of music that ‘they’ say isn’t recorded anymore. Just like Dale Watson 20 years ago, Sturgill Simpson is like a breath of fresh air in a sterile scene. Songs like the driving “Long White Line” and “Living the Dream” blow the cobwebs from a timeless formula that made stars of Merle, George and Hank. When you know that “The Promise” was originally a synth-pop single by UK band When in Rome, you can’t help but be impressed that Simpson and band have turned it into a beautiful country love song. Now that is talent. Favourites are too many to mention (everything? ), but the rocking and rollicking “Life of Sin” deserves to be a hit for Sturgill and not Brad Paisley or Kenny Chesney. The same is true of “Pan Bowl”, which closes the album. Sturgill Simpson is the real deal; a ‘triple threat’. He can sing, write and he’s damn good looking too. Country music is littered with ‘follow-up’ albums that are rushed in a bid to cash in on the artist’s success, but that isn’t the case here. These songs were all road-tested while promoting the previous album and deemed good enough to record by Simpson, who rushed the band into the studio days after coming off the road. Boy, was he right to do that!